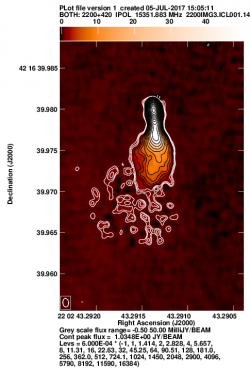 Calibrate the regular data all the way through imaging. This guide only gives the important inputs to each task. The other inputs should be default. An easy way to set all the inputs to the default in a task is to type "default taskname". getname (getn) catalog #: get the name of catalog # and put in INNAME, INCLASS and INSEQ. Other similar: geton (get outname); get2n (get in2name); get3n (get in3name) etc..
input (inp) taskname: show the inputs of taskname. tget taskname: get a task and fill in the inputs of the last time the task was run, one of the most useful commands in AIPS. ucat (uc): list uvdata catalog. mcat (mc): list map catalog. tvlod (tvlo): load a map onto the TV. tvinit (tvin): initialize and clear TV. imhead (imh): Print the file header (this can be used on both uv data and images despite the name). This will list informative things like the date of observation and the number and types of tables attached to the data. bl193bg_3sour_avg.fits (543 MB): Data we will be reducing today. 1828_1.box: Box file for imaging. 1828_2.box: Box file for imaging. 1828_3.box: Box file for imaging. 1828_4.box: Box file for imaging. 0851+202.SPLIT.1 (6.3 MB): Calibrated data for source 0851+202. 1828+487.SPLIT.1 (7.8 MB): Calibrated data for source 1828+487. 2200+420.SPLIT.1 (6.8 MB): Calibrated data for source 2200+420. The best place to put these files is in your $FITS area. This is an AIPS data area that should already have an environmental variable set up for it. We thank the MOJAVE team for maintaining the MOJAVE database and Matt Lister (Purdue) in particular for advice on the best data to select (Lister et al., 2009, AJ, 137, 3718). Start AIPS by typing aips or possibly aips tv=local:0.0 in a terminal window. Depending on your AIPS installation, you might be prompted to pick a printer, then you will be asked for an AIPS number, if you are not sharing disks with anyone pick any number other than 1. Remember that number because the data you load and work on will be under that number. It would be best for this tutorial for you to use a clean AIPS number, in other words, an AIPS number that you have not used for anything else and that has no data loaded into it. This means that AIPS will not allow you to run more than one task at a time. I usually run with dowait=-1; but for this tutorial and for beginners it is better to set dowait=1. Load the data with FITLD. Note that I am forcing an outname, outclass and outseq, we are doing it here so it will be easy to talk about specific files. clint 0.25 ➜ set CL table interval to 15 seconds. datain 'MYAIP:bl193bg_3sour_avg.fits ➜ Two things to note: 1) this assumes that the data is in the $MYAIP directory, you can use a full directory path (e.g., datain '/home/mydata/bl193bg_3sour_avg.fits) or another environmental variable if the data is elsewhere; 2) The lack of a close ' is not a typo, you must leave off the closing ' or AIPS will capitalize everything within the ' ' and you will get an error because FITLD will not be able to find the data. Note the data file, BL193BG.UVDATA.1, has a catalog number (Cat) which in this case 1. Catalog numbers can be, and usually are, used to fill in IN and OUTNAMES etc., using getn, geton etc..
Look at the structure of the data with LISTR. 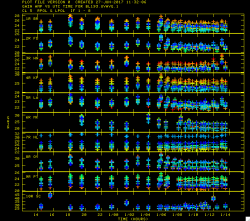 This will give you a listing of the scans as well as the sources and frequency structure in the observation. Note that even though this dataset contains only three sources, the SU (source) table still contains all the sources in the original dataset, so LISTR will list all the sources and show 0 visibilities for the sources with no data. This will give you a listing of the scans and frequencies in the observation. Load in the VLBA data reduction procedures: see EXPLAIN VLBAUTIL for a full description of the numerous procedures. Procedures are run by just typing their name, rather than using "go". Data observed at 8 GHz or lower frequencies may be effected by the dispersive delay caused by the ionosphere. This will distort images and is especially bad at very low frequencies. 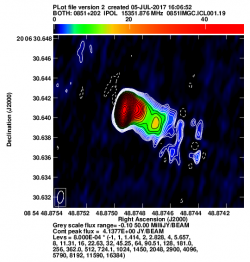 An ionospheric correction based on maps of the electron content of the ionosphere can be performed with VLBATECR. BL193BG is observed at 15 GHz so no ionospheric correction is needed. Data using phase referencing can be affected by imprecise Earth Orientation Parameters (EOPs) used in correlation. Therefore all phase referenced data should have its EOPs corrected. This can be done with VLBAEOPS. BL193BG does not use phase referencing so no EOP correction is needed. Correct sampler threshold errors from the correlator by running VLBACCOR. VLBACCOR runs ACCOR which creates a solution (SN) table, then smooths the table with SNSMO, and then runs CLCAL to apply the solutions to the calibration (CL) table. When VLBACCOR is finished you should get messages like those below that tell you what SN table and CL table are created. It is a good idea to save these messages. Plot of amplitudes (bottom) and phases (top) for source 0851+202. Now lets take a look at the fringe finders by running VLBACRPL. 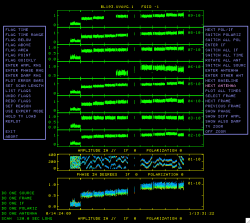 VLBACRPL runs POSSM and displays the spectrum of each baseline (to Fort Davis which is antenna 2), with the amplitude on the bottom and the phases on the top. So hit A if you want to look at a plot longer than the 30 seconds, B or C to go to the next plot, D to exit. Find and remove instrumental delay by running VLBAPCOR. Plots for source 0851+202 which show the amplitude (bottom panel) and corrected phases (top panel), for each IF in both polarizations. 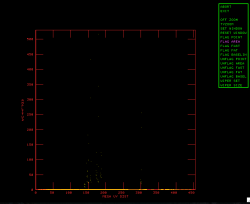 timer 0 19 26 33 0 19 36 38 ➜ scan with good fringes on all telescopes we found in POSSM plots. refant 2 ➜ choose reference antenna from in the middle of array, antenna 2 or FD (Fort Davis, TX) is a good choice. gainu 0 ➜ apply highest CL table. Again, it is a good idea to make note of the last two lines that tell you which tables contain which corrections. Most VLBAUTIL calibration scripts produce such messages. check solutions in POSSM, the jumps in phase between the IFs should be gone. The phases may also be flattened. tget possm ➜ to "get" all the inputs from the last run (it was run when we ran the procedure VLBACRPL). As you can see from Figure 2, the phases for 0851+202 have been flattened and the phase jumps between the IFs are gone. For other sources farther away in time the phases may be different from 0 but there will still be no phase jumps. Plot of bandpass for source '0851+202' . Calibrate bandpass shape with VLBABPSS. calsour '0851+202' ' ➜ use a strong source as the bandpass calibrator. Now check the bandpass solutions with POSSM. Figure 3 shows the plots generated by POSSM. The solutions should look like a reasonable fit of the bandpass shape. Perform amplitude calibration by running VLBAAMP. Plot of amplitude gains vs. time with the different colors representing the different IF polarizations. Examine amplitude calibration by running SNPLT. opty 'amp' ➜ Plot amplitudes. opco 'alsi' ➜ Plot all IFs and Stokes. do3col 1 ➜ Use 3-color symbols. tvin ➜ tvinitialize clears the tv before plotting. Otherwise you will get a mess as the table is plotted over the bandpass plot from before. Figure 4 shows that the amplitude gains change over time as the sources rise and set, with higher gains at lower elevations. The different IFs and polarizations (RR and LL in this case) are shown as different colors. Correct phases for parallactic angle effects with VLBAPANG. EDITR display showing all the baselines to antenna 10 for 2200+420. You can see for all the baselines the amplitude is low for the first scan and for baseline 01-10 the phases for this scan look like noise. We want to flag this data. 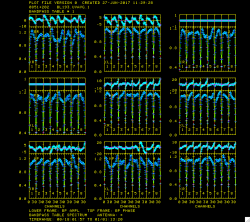 To flag this data we click FLAG TIME RANGE and hit B, and a blue box appears in the 01-10 box on the bottom. After moving the sides of the box to encompass the data that need to be flagged, hit C and the data are flagged and turn red. Edit the data using EDITR on each source separately. docal 1; gainuse 0 ➜ calibrate data with highest CL table. crowded 1 ➜ to plot all polarization and IFs on top of each other. antuse 1 2 3 4 5 6 7 8 9 10 ➜ to plot all the baselines to one antenna at the same time. EDITR plots both amplitudes and phases verses time, so this is a good way to just look at your data. For the inputs we chose, all the polarizations and IFs are plotted on top of each other. The two boxes on the bottom plot these as different colors and show the amplitude and phase for one baseline. 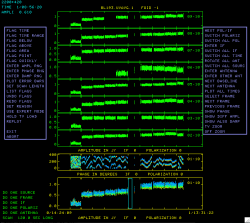 The other boxes, where the data are shown in green, are the other baselines to that single antenna. It is especially useful to look at the data this way because problems tend to be antenna based so all the baselines to an antenna will be effected. It you see potentially problematic data (especially high or low amplitudes or with bad phases (note that weak sources will have incoherent phases)), then you should wait to flag until you can see all the baselines to the other antenna in the baseline pair with the bad data. That way you can flag once, telling EDITR to flag all the data for one antenna (this is the default in EDITR, but can be changed). The data for this source looks great. Click "NEXT ANTENNA" found on the menu to the right and press "B" until you have looked at all the baselines on all the antennas for this source. At this point the data has been amplitude calibrated but the source amplitude changes from scan to scan, do you know the reason for this? Now plot the other sources and inspect. 1828+487 also looks pretty good, although there are some ratty amplitudes and phase on the last scan on baselines to antenna 10. We will just leave these for now because the final fringe fit and self-calibration might fix it. As you can see in Figure 5 this source the first scan on the baselines to antenna 10 looks bad. The amplitude is very low and the phases are noise. 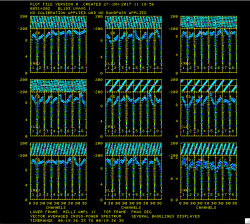 To flag this data click FLAG TIME RANGE and hit B (Figure 6), and a blue box appears in the 01-10 box on the bottom. By hitting A and moving the cursor move the sides of the box to encompass the data which needs to be flagged; then hit C. The data will be flagged on all the baselines to the antenna and will turn white in the lower colored parts and red in the upper comparison parts of the display (Figure 7). Perform a global fringe fit with FRING. The following steps through imaging are not strictly necessary since we will have to redo them once the geodetic calibration is done, but they are an excellent way to check that the calibration up to this point is correct. calsour '0851+202', '1828+487', '2200+420' ➜ do a global fringe fit on all sources. search 2 9 5 4 1 3 7 8 ➜ list of antennas to search if a solution is hard to find. aparm(6) 2 ➜ print some information on solutions. aparm(9) 1 ➜ do exhaustive baseline search. You should get something similar, but not necessarily exactly the same numbers of good and failed solutions. A small percentage of failed solutions are fine at this point. FRING will have created SN table number 5. Since we did not use a source model, FRING assumes that the calibration source is a point source at the phase center. None of these sources are point sources. Therefore the corrections FRING finds will not correct the data perfectly and, once we apply all the calibration, it will be necessary to do self-calibration with source models to get the best images. Also note that I said "at the phase center" so, no matter what the the true position of your target, this fringe fit will move the brightest spot of the source to the phase center (the position of the target in the correlation). Note that the previous step and this step can be done in the single procedure VLBAFRNG. It is broken up here just to show both the steps explicitly, but also because running the tasks individually allows for more control. Here the global fringe fit which was done in the last step is interpolated and applied to the all the calibration that has gone before with CLCAL. gainv 6 ➜ CL table with all the calibration. gainu 7 ➜ CL table to write next step of calibration in. interpol 'SELF' ➜ use 2PT interpolation. sour '0851+202', '1828+487', '2200+420' ➜ sources to which to apply calibration. So SN table #5 will be applied to CL table #6 and create CL table #7 which now includes all the calibration. We will want to save the calibration up to this point with TASAV. TASAV makes a new file with all your calibration tables. This is very useful because it contains everything you need to recalibrate your data in a very compact and portable form. It is also a good idea to do this before you do anything you are unsure about or will change important tables (AN, SU) in ways that are hard to change back. Note that there is 1 visibility but 7 calibration (CL) tables and 5 solution (SN) tables. As well as numerous other tables with information about you data (history (HI), frequency (FQ), antenna (AN), system temperature (TY), bandpass (BP), flag (FG)...). Apply calibration and make single source data sets with SPLIT. I like to work with single source files, it's less confusing, especially when self-caling and imaging. docal 1; gainu 7 ➜ apply calibration; from CL#2. aparm 2 0 0 0 1 1 ➜ aparm(1)=2 tells SPLIT to average all the channels in each IF, reducing the size of the data significantly. This will produce three files named sourcename.SPLIT.1, again type uc to look at the catalog. THIS STEP IS OPTIONAL: If everything went well in the above steps there is no need to get the calibrated data. and repeat for 1828+487.SPLIT.1 and 2200+420.SPLIT.1. Note that these data do not include self-calibration but does include flagging. WIPER plot of amplitude vs UV distance. 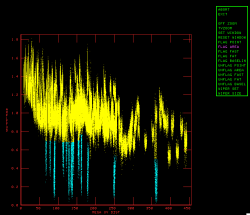 WIPER plot with high amp points flagged (in blue). WIPER plot with low amp points flagged (in blue). Ick! Look at those high points (Figure 8). Flag those by clicking on FLAG AREA, setting a box hitting the "A" key then hitting the "C" key when done, the flaged points will turn blue as in Figure 9. Now click EXIT and hit "A". Immediately type "go" to run WIPER again. This is more like it (Figure 10), but there are some low points, flag those with FLAG AREA but don't be too overzealous. Now you have 2 flag (FG) tables attached to the data, one for each run of WIPER. FG table 2 has all the flags in it. Image of 1828+487 after first run of IMAGR. Note that I came up with the parameters below especially the IMSIZE, ROBUST, RASH and DECSH by imaging and experimenting. Task SETFC can be used to recommend CELLSIZE and IMSIZE if you specify a desired field of view. The shifts were chosen, for this source only, to center the object including its jet within the image. It is recommended that you use the supplied box files. They reflect both the very obvious emission in the field and additional information from the MOJAVE project. 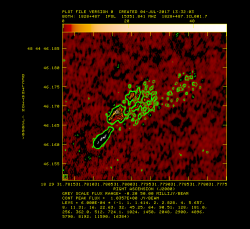 cell 0.0001; imsi 1024 512 ➜ cell size of 0.1 mas; image size of 1024x512. robust 5 ➜ Do natural weighting. This source has a big diffuse jet, therefore sensitivity and more weight on the short spacings is more important than high resolution. niter 5000 ➜ do interactive clean; with 5000 iterations, you will probably "stop cleaning" before hitting 5000 on the first iteration of imaging. Hit TVPSEUDO then "B" immediately to get color rather than grey scale. Figure 11 shows the dirty map. If you want to clean interactively, then click CONTINUE CLEAN (and "A"); after a few rounds of cleaning (about 300 clean components which the messages from IMAGR tell you) the residuals will look like Figure 12. You can see in Figure 12 there is not much else to clean inside the clean boxes although there is some flux outside the clean boxes. This isn't significant enough to box at this point, so click STOP CLEANING ("A"). IMAGR will return the cleaned map, Figure 13, as you can see there are artifacts in the map. Note that you have made two files, a "dirty beam" (the IBM001 file) and a cleaned map (ICL001). To look at the image use TVLOD (getn 6; tvin; tvlo). Use TVPSEUDO to put it into color (tvps). You can use your mouse to manipulate the colors; again look at your terminal for instructions. Hit "D" once it looks the way you want. Figure 11 shows the image with the stretch set so the noise level is obvious. 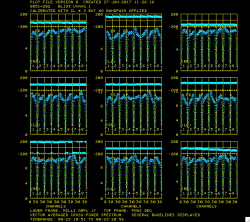 IMEAN also gives you other statistics about the image such as the maximum and total flux. So the image isn't the best, the noise is much higher than desirable, and there are hints of lower level structure but they are not much higher than the noise. So it looks like self-calibration would be beneficial. At some level self-cal is an art rather than a science, and there are various different philosophies concerning how to best do self-cal. I tend to be conservative, partially because VLBA data has fewer baselines and therefore it is easier to go off in a bad direction with the self-cal. However, these are fairly strong sources so it will be harder to make big mistakes in the self-calibration. Self-cal is done by the task CALIB. Generally phase-only self-cal should be done first, then amplitude and phase. Also we will be using clean component models (i.e., the image we just made) for the self-calibration. CALIB didn't flag any new data. Since this is such a strong source CALIB probably will not flag any of the data. However for weaker sources this is a concern, a bad model and a weak source could mean that some portion of your input data is flagged by CALIB, meaning you can take your imaging to strange places if you are not careful. Now the rms is about 1.1E-3 Jy/beam, so a little lower than last time but a much smaller drop. Lets try a much smaller solution interval. So CALIB failed on a tiny fraction of solutions and flagged a tiny fraction of the data. This is OK, it just means that with this solution interval we are on the edge of not having enough sensitivity to get good solutions. Now the rms is about 8.8E-4 Jy/beam, another significant drop, either the low solint or the extra box is making things better, probably both. So lets do one more phase only self cal with this solution interval before going to amplitude and phase. Note that it failed on fewer solutions that last time, another indication that the additional box added to the cleaning allowed for model that fit the data better. 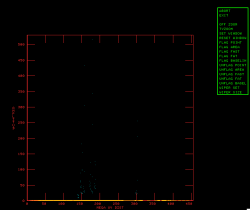 Now the rms is about 8.5E-4 Jy/beam, so another small drop. Lets move to amplitude self cal. You might have noticed that for the runs of CALIB we went back to the original data rather than the self-caled data. This is one of those philosophies of self-cal I mentioned earlier, you could have used the the output file from CALIB and done smaller increments of self-cal, I prefer to go back to the original data and just improve the model. I do this because here is less chance of getting an incorrect model stuck in the data with this method. However once we move to amplitude self-cal we want to use the data with the best calibrated phases so we will start with the last file out of CALIB. Similar messages to the phase only except it now tells you how it is adjusting the amplitudes in each IF/polarization. You may have noticed that I am avoiding boxed the bright stuff around the core, because it is around the brightest thing in the map I am worried it is just sidelobes that have not been cleaned properly, at this point I am contemplating boxing it. Also next time we run IMAGR I will increase the number of iterations, 5000 seems like barely enough. Now the rms is about 2.8E-4 Jy/beam, a big drop. Since we have a lot more structures in the model we should do more self-cal. Now the rms is about 1.7E-4 Jy/beam, a big drop, CALIB liked the new model with all that extra part of the jet boxed, which is a good sign. Also in the residuals the emission around the core is much fainter, so it looks like it was good we did not box it. More self-cal can be one, but a majority of the improvement has been accomplished. Contour map of 1828+487 after self calibration. Countour map of 1828+487 before self calibration. What is the best way to look at the images, particularly with all this low level structure? One of the best ways is with a contour map. We will use KNTR to make such a map. I came up with the following parameters after some experimentation. Note that I used verb TVWIN to set blc and trc (bottom left corner and top right corner of the image to plot). Also I am using a for loop to set the contour levels in a logarithmic fashion. I have set the contour level multiplier (clev) and the pixel range (pixra) so that we can see some of the noise. I am also using an ofm file for the background. To see all the ofm files that come with AIPS type "OFMDIR"; ofmfile 'rainbow' is closest to tvpseudo. Figure 14 shows what the figure looks like on the TV. Just for fun run KNTR with the same inputs on the image of 1828+487 before all the self-calibration. Figure 15 shows what you get, the vast improvement made by the self calibration is obvious. To make a hard copy of this figure set DOTV to -1 and run KNTR, KNTR will produce a PL (plot) table. Then run LWPLA to make a postscript of that PL table. This produces a postscript file in the $MYAIP directory. Contour map of 0851+202 (OJ287) after self calibration. This is a version of the image that uses LWPLA to make a hardcopy after KNTR. Contour map of 2200+420 (BL Lac) after self calibration. This is a version of the image that uses LWPLA to make a hardcopy after KNTR. Image 2200+420 and/or 0851+202 with IMAGR. You can follow similar steps with WIPER and self-calibration on these sources. Inside AIPS there is a procedure VLBARUN which will do all the calibration steps above except for the flagging and self-calibration. VLBARUN uses the VLBAUTIL procedures to calibrate the data with little intervention. Since I set doplot=1 and outfile the procedure will produce diagnostic plots put them in the directory set in outfile and write an html page to allow you to examine the plots easily. For an example of the output for this data see vlbarun.html, the main difference is that VLBARUN ran VLBAEOPS, which we skipped so there is one more CL table. This page was last modified on 25 September 2018, at 17:33.